Sarah Palin turned down an offer to participate in Monday's debate of Republican presidential candidates sponsored by the Tea Party Express and CNN, but the possible White House hopeful teased that she has not completely taken herself out of contention. "I'm still thinking about it," she said in an appearance on Fox News after the Florida debate when asked if she would run for president. "I'm not going to let the media tell me, dictate when a drop-dead date should be," she added. The former governor and Fox News contributor hammered Texas Gov. Rick Perry for "crony capitalism" on his mandate for HPV vaccinations and complimented Rep. Michele Bachmann for "calling out corruption in government." "People are afraid, even in our own party, to call one another out on that," Palin said on "On the Record with Greta Van Susteren." "Michele Bachmann tried to make that point tonight and watch- she's, potentially, going to get crucified." Palin had kind words for Newt Gingrich, saying the former Speaker of the House was "bold" talking about government waste, and Herman Cain, calling his background in the private sector "great." She was otherwise hard on the candidates, saying most "don't have a record to stand on" because "they haven't tackled debt and deficit spending to a degree that they should." Palin did not name a future opponent winner of the debate, and instead declared the Tea Party the night's winner. "[I'm] very excited about the validation of the Tea Party movement." Of her possible run, Palin said she's still "very engaged internally" in discussions with her family. 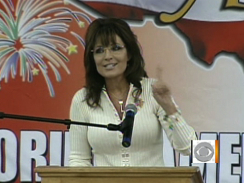 "I'm getting a kick out of getting out there, giving a speech, making some statements," Palin said. "And then, the very next day, watching some of the candidates get out there and discuss what it was we just talked about." Christine Delargy is a producer for CBSNews.com.